Ripple is a payment network, as well as the name given to the network’s cryptocurrency token. Before you buy Ripple, you would need to keep your Bitcoins ready. Bitcoins can be mined or traded for fiat currency. There are a number of ways by which you can buy Bitcoins. You can pay via cash, debit cards, credit cards, PayPal, bank transfers, exchange with other coins, or even via tokens that hold some monetary value such as Amazon Gift Cards or Skype Credits. Once you have your Bitcoins ready in your Bitcoin wallet, you would need to create an account on Bittrex. Bittrex falls in the second category. Step 2: Scroll down and you’ll see a box called ‘Get Started Now’. Click on it and it will redirect you to account registration page. Step 3: Register your e-mail address and password. You will then be asked to confirm your details by clicking on the activation link in your mail. Step 4: Once you sign-in, you will be asked to fill in personal details such as your name, address, etc. You will then be asked to verify your phone number with Bittrex to ensure safety of your account. Step 5: After completing this process, you need to activate 2 Factor Authentication system which will ensure that you and only you can open the account. This means that there is a dual layer protection protecting your account from being hacked. Any user (including you) who wishes to gain entry to the account would need two things - first, your password and second, your Google Authentication code. In order to enable 2FA, you will need to go to Settings and then click on Two Factor Authentication on the menu on the left. This will require you to download and install the Google Authenticator app on your phone, followed by you scanning the QR code which will generate a 6 digit code on your app which keeps changing at fixed intervals. 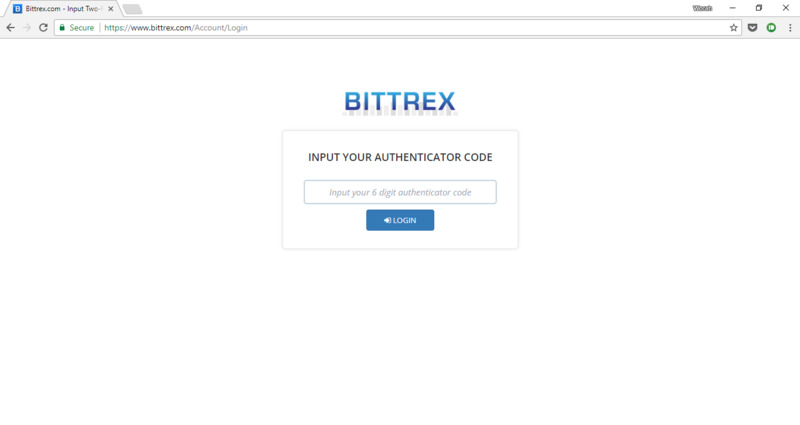 Now that you have bought bitcoins, registered your Bittrex account and secured it with 2FA, it is now the time to generate a wallet on Bittrex. We strongly urge readers to read this part very carefully. This is an easy process. On the top right corner you’d see an option called ‘Wallets’. Click on it. 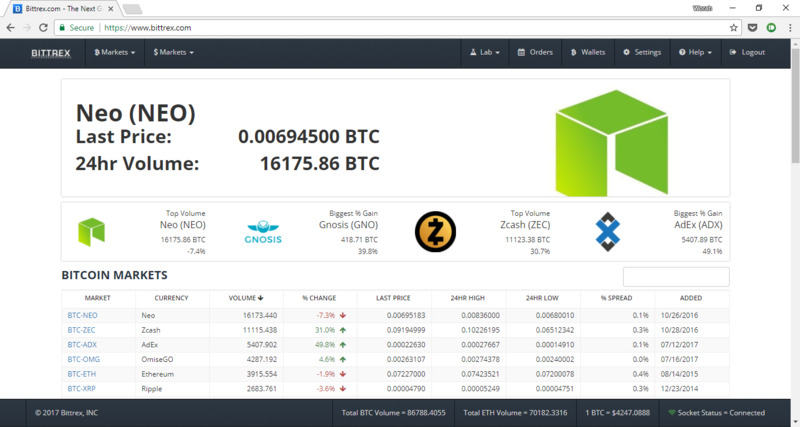 When you click on it for the first time, it will show you a large list of cryptocurrencies. Find Bitcoin ‘BTC’ and click on the Plus button next to it. The Plus button is for deposits and the Minus button is for withdrawals. Make sure you deposit Bitcoins in a Bitcoin wallet. The currency and the wallet should correspond. You cannot deposit Ripple in a Bitcoin wallet and Bitcoins in a Ripple wallet. Doing so would result in the permanent, irreversible loss of your currency. Clicking on the plus button next to Bitcoins will show you the option to generate a new wallet. Do that ONLY on the first time. This will generate a string of characters which would be your wallet address. This is your public wallet address and anyone who wished to deposit Bitcoins to your Bittrex wallet would be able to do so with the help of this wallet address. There’s also a QR Code, scanning which would result in other Bitcoin Wallets automatically knowing what your wallet address is. The thing to keep in mind here is: Once your wallet address is generated, do not generate a new wallet from this service till absolutely necessary. It is critical to know that if you change your wallet address mid-transaction, the transaction would be deemed invalid and the Bitcoins would be lost in transaction. This is an irreversible process and you may end up losing your Bitcoins. 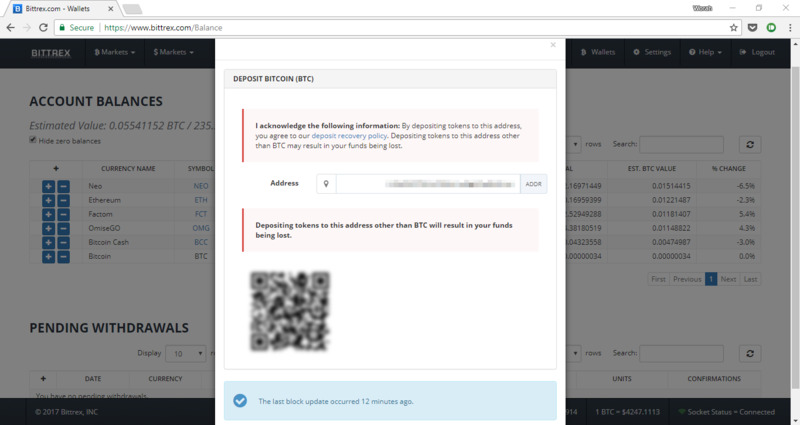 Do NOT change the wallet address while a transaction is going on. With your wallet being created, now is the time to Deposit Bitcoins to your wallet. Transfer them from whichever Wallet service you are on. For example we use Zebpay, where there’s an option to transfer Bitcoins to another wallet address. If you don’t have Bitcoins, you can purchase them using fiat currency on ZebPay and other similar apps and exchanges. To transfer from Zebpay to Bittrex, Simply scan the QR Code provided by your Bittrex wallet using your ZebPay wallet and transfer the number of Bitcoins that you want to send from one wallet to another. You are using the code of your Bittrex BTC wallet and not the wallet of any other currency. The wallet address is correct. It is strongly recommended to check it even after the QR code is scanned just to make sure your Bitcoins don’t end up reaching someone else as the process is irreversible and untraceable. After you deposit your Bitcoins, it might take as less as 5 minutes and as many as 48 hours to appear on your Bittrex wallet. It is based on the number of transactions happening at the moment as it takes time to verify transactions. Four verifications are needed for the amount to finally reflect in your Bittrex Bitcoin wallet. You could check the progress of your transaction here: https://blockchain.info/address/WALLET-ADDRESS (Replace wallet address with your Bittrex Bitcoin Wallet address). Pending Withdrawals: After you withdraw your money, it appears here in the interim period between the moment you withdraw and the moment it is deposited to your other wallets. Pending Deposits: Currencies on their way to your wallet pending a complete verification are shown here. They won’t reflect on your account balance till properly verified, but you’ll see them here. Now that you have all the prerequisites in place, it’s time to start trading. Step 1: Head over to the Bitcoin markets. On the top left corner, you’d find two markets. One with the Bitcoin symbol and another with the dollar symbol. The market that we are concerned is the one with the Bitcoin symbol. The other market that you see considers Tether, which is another cryptocurrency as the base as opposed to the Bitcoin markets, where Bitcoins are the base currency you use to trade. Tether (USDT) is a cryptocurrency which is a dollar-backed currency. However let us not get into the details of this currency and focus on trading via Bitcoins. 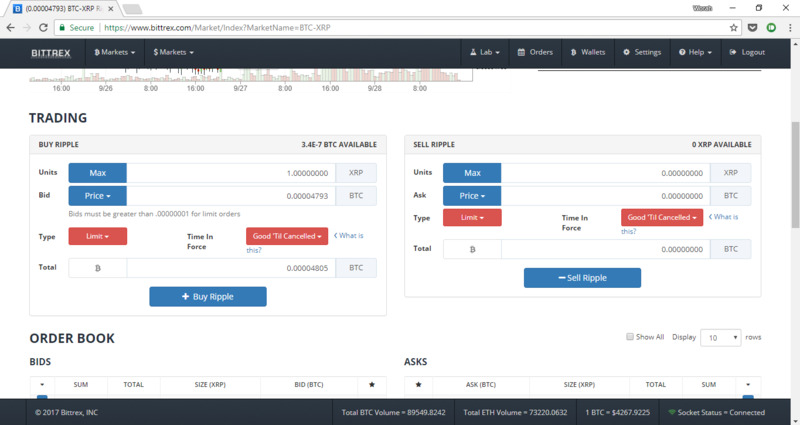 When you click on the Bitcoin Markets, you’d see an option to search for cryptocurrencies. Key in the code of your currency (for example ETH for Ethereum), and if you don’t know the code you could simply type the name of the currency and choose it from the list. Select your preferred currency, in this case Ripple from the list. Step 2: You would now see various statistics related to Ripple. Below the graph you’d see a box with the title ‘Trading’. Bid Price: The highest price at which the currency is being offered at the moment. This is similar to an auction where the highest bid takes the item being auctioned. Last Price: The last price at which someone bought this currency. Ask Price: If you wish to buy the currency at a rate lower than the existing market rate, you can set an Ask Price and the transaction will only take place when there’s a seller offering a coin at that rate or lower than that. Select the type of Bid you want to make - in this case we’re going with last price. Your Total will automatically be updated. Once you’ve decided, press ‘Buy Ripple’ to make the purchase. You will then be shown a confirmation screen where you would be asked to confirm your payment. Your purchase will be shown in your wallet and a new Ripple Wallet will be formed. The amount will automatically be deducted from your Bitcoin wallet and Credited to the Ripple wallet. Your order is now complete. 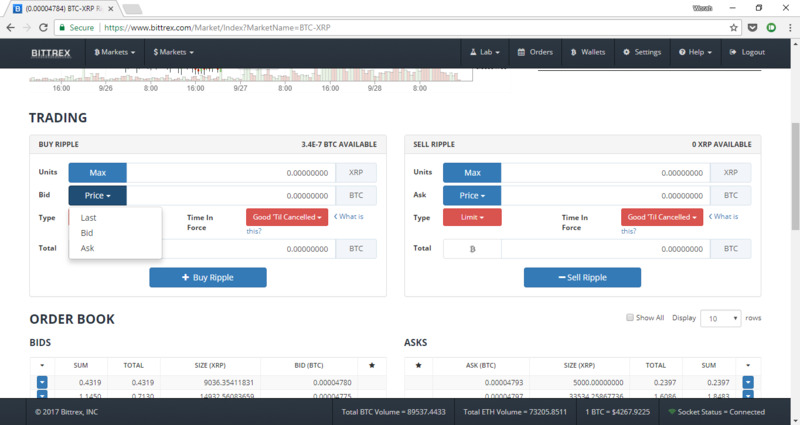 This is how you buy Ripple using Bitcoins via Bittrex. Chapter 2 - How to Buy and Sell Cryptocurrency? 2.2 How to Buy Bitcoin Using PayPal? 2.3 How to Buy Bitcoin with Cash? 2.4 How To Buy Bitcoin Using Credit Card and Debit Card? 2.5 How to Buy and Sell Bitcoin on Zebpay? 2.6 How to Buy Ethereum? 2.7 How to Buy Neo? 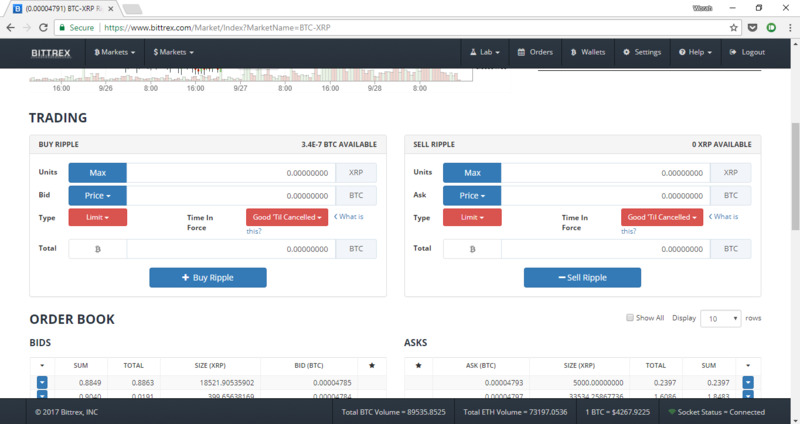 2.8 How to Buy Ripple? 2.9 How to Buy Litecoin? 2.10 How to Buy Factom? 2.11 How to Buy OMG? 2.12 How to Buy SiaCoin?